As you (who have followed my blog OR know me personally) know – at times I tend to ‘follow my fancies’ and decide to attempt/try something ‘new’. This time my brain has got me searching out ideas for going ‘vintage’ for next year’s Log Cabin Days. 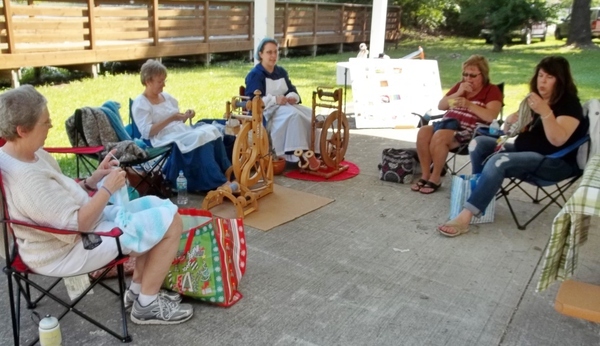 Around the grounds you will see various ladies strolling, in various ‘period piece’ clothing – the two Spinner – ladies who joined us both had on period wear: one wore a white blouse, dark skirt and a knit shawl, the other had on a cotton dress with a (pinned on top) full apron. Yep, guess I’m in an EXPERIMENTAL mood today – we’ll see where this all pans out! On the Other Side – Finally! Let’s just say, for the past two days, I’ve been sweltering! Mama – it was HOT! 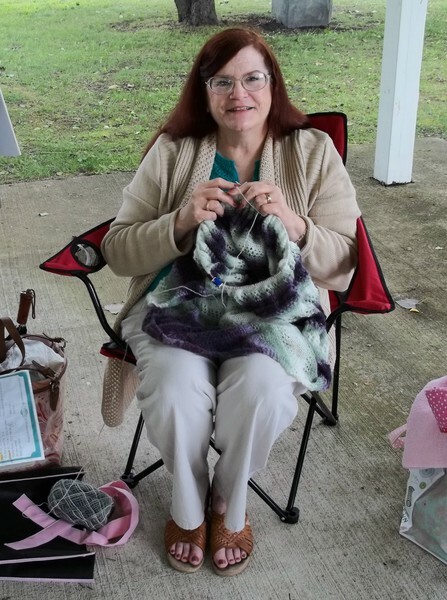 Log Cabin Days was great – 17 of my ladies showed up (at various times) to knit/crochet with me; lots of people took our business cards so hopefully, we’ll get some new members! All totaled, I don’t think there were as many people coming through the event as in past years – even the other presenters (the encampment people) agreed. On the down side we had ‘midges’ (little tiny black bugs) which kept ‘bugging’ us plus TONS of cottonwood floating in the air, on the ground almost in piles, etc. I inhaled some, several times! Two new ladies who were spinners joined us and they were lovely! I really enjoyed chatting with them – turns out one of them is also a home schooler, so we had that in common, also. Sunday it rained, on & off, during the day. At one point I was visiting with friends in a small pavilion – I said “It’s time I get back to my ‘station’ – I stood up – it started to POUR! Sat back down, repeat – it took me THREE tries to actually get to walk (minus the downpours!) from that location, across the park, over the bridge, to our little pavilion. Going back over the photos I took this year I realized I never remembered to have someone else take a photo of ME with my ladies! Oh, well – next year. I felt sorry for the guys who were dressed up in formal costumes – some were actually wool! UGH! When it’s over 80 degrees F., I’m pretty sure they were really sweating! It was a good two days but I’m glad I’m back home again! “It’s a design deviation!” It’s just fine! Ended up working on baby hats for the duration of the two days – those are just straight knit/purl (even then, at times I got to where I forgot where I was in the pattern when it came to decreasing!) Just too darned HOT!!! We’re still waiting for my husband’s cousin to come fix our air conditioner – sure hope he calls to remind him today (it’s been really hot inside – today’s OUTSIDE temperature is 73 – inside it’s 83!!!) UGH! occasionally. Toss again before serving. cook on Low 6-8 hours or High 4-6 hours. roast with gravy over mashed potatoes. 2 minutes or until shrimp turn pink. stir in seasonings. Toss to coat. Combine cantaloupe chunks & 1 C.
2 C. milk, syrup, sugar & salt; mix well. cover & freeze until firm before serving. salad & stir to combine. Refrigerate. greased 9 X 13 baking pan. * Cool crust. sugar until smooth; blend in Cool Whip. needed and PAMPER yourself a little! delivered today: 119 – that’s SOME total!!! As you probably know, today is the ‘Day Before’ Log Cabin Days – it’s been a bit hectic, but manageable. Baked another loaf of banana bread (to get rid of 4 rather black bananas), Grandson came around 10:15, played about 40 minutes of a video game, then announced he was ‘taking a break’ – promptly fell asleep and STAYED that way until I woke him up around 2:20 p.m.! His dad mentioned he’s spent the night at a neighborhood friends house and they didn’t get much sleep (leave it to Grandma’s house to get quiet and rest!). That made watching him REALLY easy for me – managed to get most of the ‘stuff’ I have to take tomorrow all organized – YAY! It’s a HOT one today – really MUGGY! Right now, at 5:35 p.m. the temp says 80 degrees; all I know is: My car was REALLY HOT! Long story short the above dishcloths were all crocheted by one lady – she’d been in the hospital overnight and then emailed me to make sure I got her donation; we met for coffee, then I drove all the dishcloths over to the site for tomorrow. Since I know I won’t be here much in the next two days, I stopped at Dollar General (don’t hardly ever go there, but it was close) and bought some cheese-filled bratwurst & buns for dinner tonight (and extras). In among the many little ‘last minute’ things needing to be done was the printing of a few more of our Knit Group Business cards. I am SO glad my husband has taught me to be more independant/willing to venture and attempt-try things that I used to think were out of my knowledge-zone. Things like when the printer suddenly decides to jam when I put in two sheets of the business cards. I remember how to remove the jammed paper, but completely go brain dead when it comes to putting back the little plastic cover to the paper feed! I tried & tried, finally he comes in and gets it done in one ‘click’! Turns out I was trying TOO hard – it just sort of falls into place – duh! Along with that came the paper jam, me shutting off the printer while fiddling with it, then going to click on my Publisher file with the business cards on it-Publisher kept popping up a little box that said something like: “Publisher has deemed this file to be corrupted. It will not open the file, to save your computer.” UGH! REALLY??? I clicked on it 3 times, shut it down and tried again and THEN IT HAPPENED – I FIGURED OUT A WAY AROUND IT!!! Right clicked the mouse which brought up a spot that said: save to desktop – BINGO! Went to my desktop, clicked on it and printed the cards! YAY! This wouldn’t have been such a big deal except – every one of those cards was hand-drawn (on the computer) by me – we’re talking at least 2 hours work which I CERTAINLY did not want to lose! (I’m not all that computer saavy – I sort of do things by the seat of my pants, metaphorically speaking). Anyway, it worked, I have more business cards to take tomorrow – problem solved – for now! place tomato slices in bag & shake to coat. Heat oil over medium-high heat in skillet. adding more oil, but add only if you need to. they are all either brown or olive green. hand. Fold in Cool Whip; set aside. on top of pudding; repeat layers. then refrigerate at least 2 hours. slices on paper towels & serve. wave, just enough to soften it. lime peel & juice from 1/2 the lime. & no longer pink (10-15 min); drain. powder. Mix in sausage & cheese. Spoon by 1/3 cupfuls into muffin cups. 2 T. fresh lemon juice (approx. with a tight lid & shake vigorously. before serving to blend flavors. tots in a single layer over top of cheese. & sprinkle with chives, if desired. until ground beef is no longer pink and onion is tender. for 20 to 30 minutes, or until cabbage is tender. & cook on Low 5-6 hours or until meat is tender. of pan evenly & bake 10 minutes. That’s what’s happening around here; hope you are able to relax a bit, stay cool and enjoy this beautiful Summer. 57 dishcloths ready to deliver! The above photo gives you an idea of the amount BUT – there are still about 62 MORE dishcloths waiting to be picked up! One of our group has been in the hospital (got out yesterday) and she’s trying to decide how/when to get them picked up/delivered to me. Originally I thought it was going to be tomorrow, but now I’m not sure (right now she has a migraine). We’ll see – I told her that if, by some fluke, we DON’T get them – they can always be picked up later and the Historical Society will be able to use them in their before Christmas sale – so we’ll see how it pans out. The ladies in the group are always gracious and welcoming – we had another new person Tuesday night – YAY! I’m, for now, just working on baby hats and the occasional row or two on the current baby blanket. Chatted with my husband today about the logistics of the ‘to and from’ for both days. Saturday he will be driving me to the site, then picking me up later that evening. Sunday I was originally going to go to church then come to Log Cabin Days, but now that will not really work out, as someone should be there with our sign & ‘stuff’ (that would be me). I was going to drive myself, but then that leaves me lugging the sign, table covers, my knitting, folding chairs, etc. ON THE SHUTTLE BUS! That won’t work! Now the plan is: husband is going to skip Sunday School, drop me off, go to church and pick me up at the end, after 4 p.m. YAY! (As the years go by with this ‘project’ I keep accumulating more ‘STUFF’ to haul along – first year it was just me & my knitting! I don’t even think I brought any business cards! Oh well – it will all work out in the end! Our weather is being goofy again – overcast, a little chilly 77 degrees F. Weather for Saturday is Sunny (yay) but Sunday is 60% chance of thunderstorms. (yuck). I remember two years ago we had to close early on Sunday because there was a BIG thunderstorm coming in – I think we left at around 2:30. I felt bad because they make money with this project and closing early cut into that, but what can you do? Cool cakes on racks until cooled. pineapple, sugar, sour cream & 1 C.
sides of cake. Keep refrigerated. chunks; salt & pepper to taste. salsa & seasoning; mix thoroughly. with tortilla strips & serve. out some of the water. cucumbers & onions to dressing. additional 3 minutes; stir in evap. milk. Boil & reduce heat; simmer 3 minutes. Lightly grease 12 tartlet pans. prepared tartlet pans; set aside. into tarts & garnish with paprika. in blender until smooth. Heat 1 tsp. serve topped with remaining nuts. pan sprayed with nonstick cooking spray. Bake 35 minutes or until chicken is done. shredded cheese & serve with salsa. corn flakes. Bake 30 minutes. spray. Mix butter, Panko & Parm. foil that extends to edges of the pan. from oven & evenly spread with filling. bun with BBQ sauce & cheese – YUMMM! baked potatoes – works for me! pour over past mixture & toss to coat. stir in 2 T. basil. Mix half with chicken mixture. cream cheese mixture & mozzarella; cover with foil. Place melted butter in shallow dish. cool so that you can safely handle them. Brown pork chops in oil in heavy skillet. pork chops are cooked, approx. 25 minutes. stand 5 minutes.Serve pork chops over rice. to form a crust. Bake per directions on pkg. potatoes are tender. Drain & let cool. place on top of salad as a garnish. Slice whole zucchini length-wise, in half. a baking tray & sprinkle tops with cheese. brown the tops & melt the cheese. in parsley, black pepper & 2 T. cheese. is a state of mind – right? it’s raining!) Hey – DUCKS like it!!! Up and At ‘Em Monday! Here we are at the start of another week – what to do? That was the first thought in my head as I awoke this morning. I knew there were several things I was supposed to get done – but now, remembering them? That’s another story! I keep little bits of paper all over the house for exactly those moments; you know – when you’re printing something on the computer and something goes wrong (ie: you end up printing the ENTIRE batch of pages when you only wanted to print ONE recipe? Those times!) I cut the paper up into note-sized bits then use them for recipes, notes, etc. Well, first thing today is the finishing, printing and (hopefully in the next day or so) mailing of my special needs group’s next July/August newsletter. It was pretty much done, composing-wise – just had to finish writing another article and proof-reading it. That’s done and now I’m working on the printing of 50+ copies (just finishes stapling #24 – this particular issue has an extra Memorial page for the student I believe I mentioned in another post. She passed away about a week ago from uterine cancer – lovely girl, but restricted to a wheelchair – now she’s FREE! moisten. Pour batter into prepared loaf pan. then turn out onto a wire rack. sugar, salt & pepper if needed for balance. croutons are crunchy/dry and slightly toasted. Sprinkle with garlic salt & remove from heat. heat. Add remaining water & chill. meat mallet until it’s about 1/2″ thick. half (should have about 16 (2-3″) pieces. hot pan. Cook about 9 pieces at a time. lid & let chicken simmer about 2 minutes. taste & add more salt/pepper as needed. Cook meat in skillet until browned; drain. microwave about 3 minutes to melt cheese. Top with lettuce, green onions & red bell pepper. to watch; do not let it boil over. Bring some salt water to boil in a soup pot. Add broccoli to soup pot; simmer 3 minutes. Strain & immediately plunge into ice water. thoroughly. (this will help brocc. stay green). Once chilled, remove & let drain & dry. add 1 C. grated cheese; add diced ham & mix. completely melted & sauce had been made. minutes, until top is browned. each brownie. Bake 8-10 minutes. outdoor flower pots – right? It’s Saturday – the WEEKEND! YAY! Finally – been waiting for this day for 6 days now – finally a day to MYSELF; to catch up on stuff AND relax a bit. Woke up (for no good reason) at 6:30 a.m. (Waaaaay early for me) and decided to finish knitting the baby hat I started yesterday. Didn’t want to wake my husband, so ended up knitting another one, just because. Started the laundry and remembered I was going to defrost the BIG upright freezer in the basement, so I started that. Every other time I’ve done this I’ve emptied the freezer and put big steaming pots of hot water in (with freezer OFF), shut the door and let the steam do it’s work. This time (for no good reason other than I didn’t feel like carrying lots of steaming pots of water up & down the basement steps) I just shut it off, left the door open and went upstairs. About 2 hours later I went to check and was VERY amazed! Almost all the big chunks of ice had melted (we have a floor drain – don’t panic!). I’m going to give it about another 1 1/2 hours and go check again – this is, by far, a MUCH better plan than my old one! All I have to do then is just wash it down with some soapy water, rinse, dry and turn it back on. I’m going to wait about an hour before putting the food stuffs back in. Job done – the EASY way (this time!). Next up on today’s agenda is getting out my summer clothes and moving the winter box into the summer clothes space. Been grabbing a few tops out of the box but it’s situated under a table and rather hard to get at; I’m guessing that our weather will soon heat up to where I’ll be needing my shorts and light-weight slacks. 30-35 minutes or until top looks cooked. no pink remains; drain any fats. through cooking of all tomatoes. *Variations: Omit chili powder, add 1 T.
tsp. cumin OR 1 T. chopped fresh cilantro. tortellini & cook accordg. to pkg. fork & serve. Makes 2 1/2 C. cooked. on each side or just until shrimp turn pink. top each with about 1/4 C. avocado mixture. In bowl, mix Bisquick, milk & eggs. chicken broth, vegetables & seasonings. less than 1 T. batter into each muffin tin. then remove to wire rack to cool. crust & freeze 2 hours. cook until thickened, about 10 minutes. as this may cause the eggs to curdle). sauce – yummy stuff! )Well, friends – time for me to get off here and start moving clothing boxes! Lunch with my friends on my birthday! Yesterday turned out to be a GREAT day all around; first went to lunch with the two ladies above – we’ve all been friends since high school. 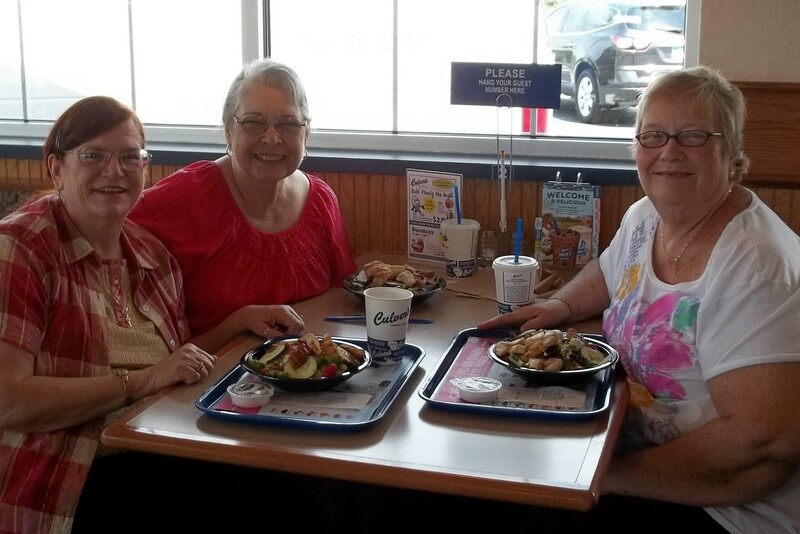 (Lunch: Culver’s – all of us chose Grilled Chicken/bacon blue cheese/cranberry salads – really tasty stuff! There were also ‘interesting’ presents: $3 off any purchase at CVS, free car wash at my dealership, free ice cream sundae at Culvers (I decided I really didn’t need it – AND they didn’t have my favorite ice cream: I’d gone on line to see their menu before going to the restaurant and the SITE said that the ‘flavor of the day’ was Butter Pecan! Got there and it was something like Cookie Dough – YUCK!). Tried to talk my two friends into getting the free sundae and eating it FOR ME, but they both declined. Last night was my Special Needs group and they somehow found out it was my birthday, also. Last night was our monthly Music/Birthday night, so I got included in the photos & Happy Birthday song. Also received some nice gifts – some are still ‘coming’ . . . keeps me curious! Today was coffee with two ‘other’ friends – nice conversation – we went to Panera and ended up chatting for almost TWO HOURS! Next I stopped at Michael’s Crafts to see if I could find another project for grandson to do; he likes craft stuff AND it helps keep him occupied. I ended up getting a small loom for making, of all things, potholders! You remember THOSE: you get all these cloth loops and you string them back & forth to make a potholder! The kit came with enough to make three: one for his Mom, one for his other Grandmother and one for his Great Grandmother! I see it as a Win/Win situation! His eighth birthday is coming up soon; also found a nylon BIG frisbee-type thingie; it’s a good 3 feet in circumference; ought to keep him busy at his house! His actual party at his Dad’s house is the second day of Log Cabin Days, so we’ll be coming at the tail end of his party but that’s OK. He’ll have his ‘buddies’ to play with, so having Grandma & Grandpa come is not a really big deal. Tomorrow night is our last Gym Night for the Special Needs group until Fall; this time we’re going to have an Ice Cream Sundae party (along with a short devotion). I know they’ll LOVE the treat – complete with all kinds of toppings. Sprinkle pork lightly with salt & pepper. in small bowl. Mix well with fork. in each cup of a mini-muffin pan. Press crumbs to form shallow cups. place one rectangle into each cup. bowl, combine flour, baking powder & salt. from pan, let cool completely on wire rack. Spoon caramel drizzle over cooled cake. constantly. Remove from heat; whisk in butter & vanilla. NOTE: Make sure you drizzle caramel while it’s still HOT. & top with lettuce, tomato, onion & salsa. thoroughly, and continue with recipe above. sauteed, roasted or grilled meat or seafood. butter, milk & honey until combined. dough & pinch together at top & bottom. Place on cookie sheet about 2″ apart. Finish wrapping remaining hot dogs. puree on medium speed 1 minute. to keep from sticking to bottom of pan. on some steaks, so dinner will be steak & eggs! the hospital) Make any sense, NOW? On that note, I’ll close! Looking at my calendar for the week – looks like I’ll be traveling A LOT! Today found me riding along with my friend and leader of our special needs group; we went to pay our respects to the family of one of our ‘kids’. This ‘young lady’ was in her 40’s, severely handicapped in a wheelchair and had been going through chemotherapy for ovarian cancer; she had suffered about eight months. She was well loved and you could tell – she has a lovely family; it’s SO good to know that, even though she lived in a group home, she was WELL loved and taken care of – she will be missed. Tomorrow I’ve decided to ‘brave it’ and get my driver’s license renewed. Normally that would not be a big thing, except it’s probably been about 7 years since I’ve had to do that and I’m pretty much expecting a WRITTEN TEST this time. (my driving record is clean – (no points) or accidents in I can’t remember when – hope I’m not jinxing myself here . . . just sayin’). I just spent time thoroughly going over the on-line booklet from our Secretary of State: “What Every Driver Should Know”, took a practice test (got 100%), so hopefully I’m ‘good to go’ (I’ll let ya know tomorrow!). Last time I remember taking one of those I missed one question – it was something about driving a truck in the mountains. Let me tell you: We DO NOT HAVE MOUNTAINS IN MICHIGAN! I know NOTHING about driving in the mountains! The lovely lady who gave me the test said: “If you were to guess – what do you think is the right answer?” I gave her my thoughts and she agreed. (note: husband says you only have to get a 70% to pass – we’ll see!). I’ve been driving since I was 17, so that’s about 47 years now; had 4 accidents in my life – three of which were caused by other people, one was an unavoidable during a freak snowstorm and I couldn’t stop. The policeman said No ticket, but I did have to report it to the insurance company – no points. (In fact, ONE of those accidents was really freaky: I was slowly approaching a red light on a 2 way road when I looked out my left side to see a car driving VERY slowly out of a party store parking lot – he drove straight into my left side! There was no where I could go – turns out he was VERY drunk, all information he gave me was false and he drove away before the cops came! Wonderful . . . . Anyway, tomorrow’s the ‘big day’ – I’ve been avoiding it for awhile now, but Wednesday is my birthday, so I HAVE to get this done or not be able to drive! I’m curious to see how many years this next license will be for. On the renewal note, had to look up another thing that’s been bothering me: I currently have the red organ donor ‘heart’ on my license – I’ve heard (from others) that I will no longer be able to do that, being a cancer survivor. I went on line to our Secretary of State and found out that they can still use my organs IF I’ve never had a blood-born cancer – amazing! I only had radiation, and the cancer was NOT in my lymph nodes, so looks like I can still do that! I have a friend who, in his early-40’s suddenly needed a heart transplant – believe me, organ donations became front and center and made me a BIG supporter of that. You just never know who or when someone will need them after you die. My thought is: It’s my LAST gift to those who are still here – USE THEM; certainly I will not need them any more! 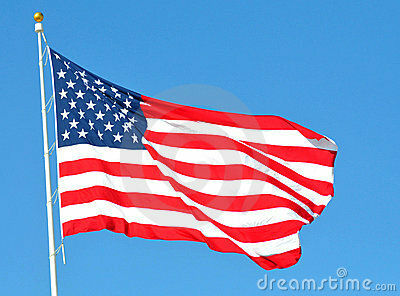 The craziness continues Wednesday; lunch with three of my lady friends from church, then special needs group that night. Thursday is another lunch with two other friends, Friday is my grandson all day. Looks like Saturday (so far) will be my ONLY free day – we’ll see. Looking at gas prices in our area, not so good on all the traveling. Today, Weds and Thurs will be great gas-guzzlers – not close trips, any of them. Oh well, if ya want to par-tay, guess ya have to pay the (gas) price, right? (We’re looking at almost $3.90/9 for regular) – could be higher, I didn’t look today (still at half tank). Brown sausages accordg. to pkg. place on roll & top with a sausage link. Prepare pudding accordg. to pkg. edges pull away from sides of pan. chop nuts & add chicken. Put 2 C.
over top & bake 30 minutes. Strain pineapple juice from can into a bowl. in plastic wrap, twisting ends. pinwheels flat on serving plate. drain grease. Stir in ketchup & mustard. well to combine. Add seasonings, stir to combine. halves on plates & top with chicken gravy mixture. Spray 8 X 8 baking dish with nonstick spray. dry seasonings in pan; stir until combined. & cilantro on top; serve hot. flour, cocoa, baking soda & salt. together sugars, butter & 1/4 C.
peanut butter until light & fluffy. In small bowl, stir together 3/4 C.
It’s another warm day out there, sunny & clear blue skies with big, fluffy clouds: right now it’s 87 degrees F. Glad I don’t have to go anywhere else (that I know of) today; our house is brick and stays pretty cool. Planning on getting out the knitting a little later; I actually spent the entire day yesterday KNIT-FREE! Amazing! It’s down to the two Veteran’s Hospital baby blankets (one 3/4’s done, one 1/4 th done) and knitting more baby hats for our local hospital. I’m thinking of saving the baby blankets for when I got to Log Cabin Days next weekend; since I’ll be there 7 hours Saturday and 4 hours Sunday, that will be (knitting) time well spent; might take some yarn for baby hat knitting, too (sometimes it gets boring just knitting the same thing for hours & hours). Hope you have a LOVELY, cool and enjoyable day! Once again the SUN is out and it’s a (chilly) 64 degrees, but clear skies, so it can’t be all bad. Looking at the calendar, it’s hard to believe we’re already mid-point of June – graduation parties are over (for the most part), some weddings – but it’s SO hard to believe Summer is marching on RAPIDLY! Remember those days and weeks of looking at all that snow and wishing/hoping/wanting SUN and GREEN GRASS? Well it’s HERE! (Can’t say that I’ve really taken advantage of that, though – keep thinking: “You could take that knitting OUTSIDE, you know!” but I usually don’t – silly me. Once again, since Father’s Day is tomorrow, thought I’d throw in one more batch of recipes. Oldest son stopped by yesterday to drop off our grandson (I don’t get to see this son very often, even though he lives about 5 minutes away – he’s usually working – he’s the chef). Grandson had fun painting the coffee mug for his dad – hope he remembers to give it to him tomorrow! (During the weekends, grandson is shuffled back & forth between the Mom & other grandparents, so he won’t see his son until tomorrow – hope the ‘mug’ makes it to his Dad in one piece!). iron skillet with nonstick spray. crispy, about 15-20 minutes longer. 1/2 C. of mixture for basting. skewers on grill over medium heat. last 3 minutes of cooking time. vegetables in a large roasting pan. add peppers, onions, cilantro, Worsch. & vanilla extract; beat until well incorporated. Slowy fold half of Cool Whip into pudding. boil. Remove from heat & cool 20 minutes. of banana pudding mix over top of bananas. Parm. cheese, Italian seasoning & paprika. want 2 layers, total) in bottom of crockpot. the dry ingredients in bowl over chops. dry ingredients. Cook, on Low, 4-6 hours. Velveeta mixture, toss to coat. butter until there is no more dry mix. remaining oat mixture evenly on top. or just plain enjoying the day!